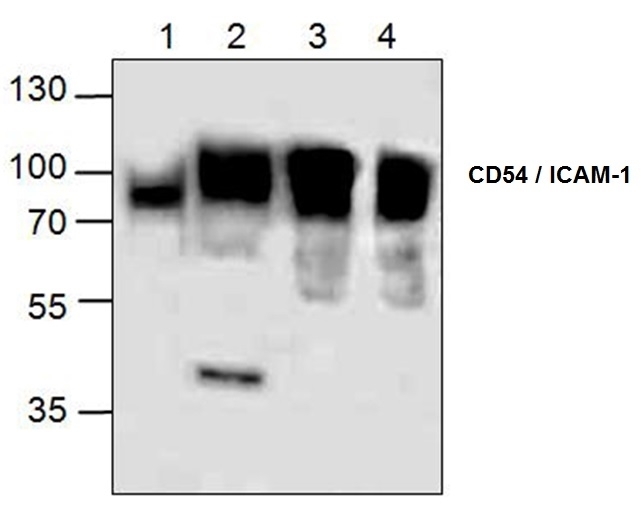 Rabbit anti CD54 / ICAM-1 antibody recognizes the CD54 antigen also known as intercellular adhesion molecule 1 (ICAM-1). CD54 is a 532 amino acid single pass type I membrane glycoprotein containing five Ig-like C2-type domains. CD54 is widely expressed and acts as a ligand for the leukocyte integrin LFA-1 (CD11a/CD18) and Mac-1 integrins, it is the major receptor for human rhinovirus (Staunton et al. 1989). CD54 is highly expressed on activated endothelial cells (Favoloro 1993) and plays a role in transendothelial cell migration to sites of acute inflammation, functioning primarily as an adhesion molecule between endothelial cells and leucocytes, following injury or stress (Manes and Pober 2011). Levels of soluble CD54 in serum (Matalliotakis et al. 2001) or urine (Kim et al. 2006) can be potentially used as an indication of infection, inflammation and certain tumors, and as a target for immunosuppression in transplantation.